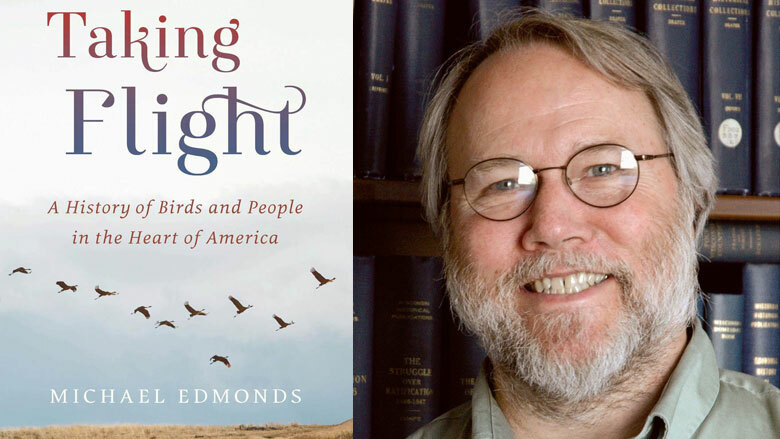 Michael Edmonds’s new book, Taking Flight: A History of Birds and People in the Heart of America, provides an enlightening and well-researched account of our always-evolving relationship with birds. Edmonds is director of programs and outreach at the Wisconsin Historical Society and the author of two scholarly-yet-accessible books, Out of the Northwoods: The Many Lives of Paul Bunyan, With More Than 100 Logging Camp Tales (2009) and Risking Everything: A Freedom Summer Reader (2014). Edmonds is also a dedicated birdwatcher, and his passion for both bird observation and conservation comes through in Taking Flight. A researcher at heart, Edmonds has spent the last twenty-five years poring over archaeological reports, missionary journals, letters, early scientific treatises, memoirs of Native American elders, and Midwestern folklore to reveal how our ancestors thought and felt about the same birds we see today. The respect and knowledge with which Edmonds deftly leads the reader through this history brings a fresh, exciting perspective to a seemingly mundane subject. It turns out that birds have always fascinated humans. Some of the first humans to inhabit the Midwest, such as the Aztalan and Cahokia peoples, left behind petroglyphs and stone objects featuring carvings of birds. Native Americans built effigy mounds often in the shape of birds, and Edmonds notes how “allusions to birds permeate the entire cultural experience of American Indians.” Superstitions held by the many immigrant communities across the Midwest and the stories and folklore told about birds provide glimpses of the role birds have played in our lives over the generations. Today over 50 million Americans head outdoors, sometimes before dawn and in inclement weather, just to catch a glimpse of their favorite species. After reading Taking Flight, I’d argue that Edmonds is right—our relationship with birds says a lot about us. While Native Americans lived closely with the natural world, revered birds, and relied upon them for sustenance, the early explorers in the New World were focused on collecting, categorizing, and capitalizing upon native flora and fauna. In the 19th century, as manifest destiny took hold, pioneers and sportsmen alike hunted several bird species to extinction, most notably the passenger pigeon. A collection of over sixty historic images provides readers with visual evidence of how subsequent generations revered, depended upon, and, sometimes, slaughtered birds native to the Midwest.